Cobalt mining in the Democratic Republic of Congo. The spread of EVs is widely expected to result in shortages of the mineral. Solving those conundrums is the focus of hundreds of companies and thousands of scientists all over the world. And in that crowded field, Tesla Inc., a French billionaire and a startup in Massachusetts are pulling ahead. Below is a list of the most promising players and the technologies making and selling these futuristic batteries today. Battery makers are working to pare down the amount of cobalt in their devices to the bare minimum to control costs and reputational risk. The problem with cobalt is that it’s largely mined in the Democratic Republic of Congo, a country that’s been a conflict zone for decades. 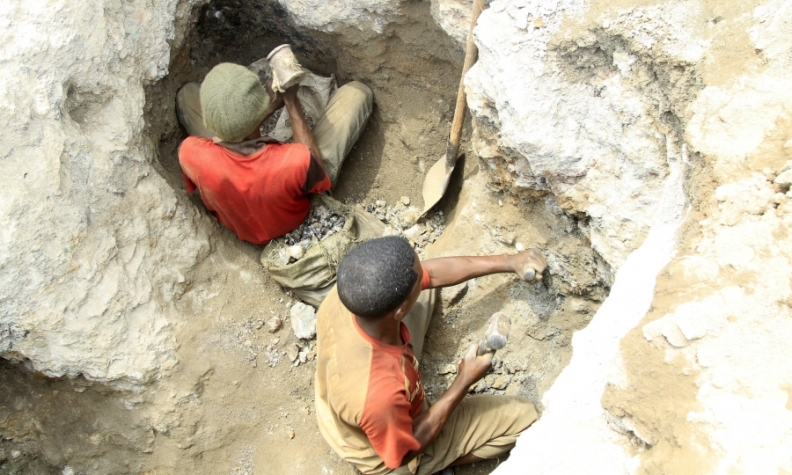 While most of the material is extracted in commercial mines, about 15 percent is estimated to be from artisanal mines that often use child labor, according to Darton Commodities Ltd. So companies are under increasing pressure to be able to track where their cobalt is from and show that it’s ethically sourced. This is easier said than done, as the vast majority of the mineral is processed in China where materials from different mines are mixed together indiscriminately. The Congo government recently said it will raise royalty taxes on producers for the second time this year. The instability of the supply chain coupled with soaring demand for the material from the fast-growing electric vehicle sector led cobalt prices to hit a peak of $44.08 a pound in late April, more than quadrupling from a level of $10.60 at the start of 2016. The metal is currently trading at $34 a pound. The battery that Tesla’s currently making for its Model 3 cars and its PowerWalls currently contains less than 3 percent cobalt, according to the company. That’s less than than in the devices that the leading manufacturers in Asia that are targeting for the future. It started manufacturing it in June last year, ramping up production in line with its Model 3 output which is targeting 500,000 vehicles in 2018. Tesla said in August that it’s producing 20 gigawatt-hours of batteries per year. While there are a few smaller companies researching and manufacturing batteries without any cobalt at all, from Lithium Werks in the Netherlands to U.S. startup Conamix, they’re not producing them anywhere close to Tesla’s scale. Korean chemicals giant LG Chem Ltd. currently makes batteries with 20 percent cobalt. It’s aiming to halve it between 2020 and 2021. SK Innovation Co Ltd. in Seoul has finalized the development of a battery that currently has 10 percent cobalt, but isn’t making it yet, according to a spokesman. Battery mishaps frequently make the news because the power packs can catch fire. The Samsung smartphone and the Boeing Dreamliner incidents are hard to forget. Electric vehicle batteries are also susceptible to this in the event of a crash that punctures the power pack. The reason for this is the liquid electrolyte. It’s a flammable solution that carries the charge from one end of the battery to the other. If it leaks, it can ignite. In order to avoid this, battery makers are trying to switch it to a solid material. Blue Solutions, a division of Bollore Group, the French company owned by billionaire Vincent Bollore, is leading the pack in solid state batteries and already has two factories up and running. This is an area that has attracted close to $400 million in capital in recent months. Ionic Materials, a startup based in the U.S. working on replacing the liquid with a plastic, raised $65 million in its Series C round earlier this year. It counts Renault-Nissan-Mitsubishi, Hyundai, Total and Hitachi among its investors. Over the summer, Volkswagen channeled $100 million into QuantumScape, a company in California that’s working on a similar device. The carmaker said it wants to establish a production line for the technology by 2025. Blue Solutions is already making solid state batteries at a commercial scale. Its factories in northern France and Canada are pumping out 500 megawatt-hours of packs annually, enough to power 10,000 electric vehicles. It has partnerships with carmakers such as Daimler and Citroen and engineering firm Gaussin Manugistique. Blue Solutions is planning to introduce on an upgraded version of its solid state battery that’s expected to store 40 percent more energy in the second half of 2019. The ultimate goal of a battery is to pack the maximum amount of power into a very small and light space. That’s where energy density comes in. The more power a battery can store, the longer the car’s range and the more hours a phone or laptop lasts between charges. Weight is also key. The lighter the machine is, the less energy it’ll require for propulsion. This is especially important for vehicles, drones and the nascent electric plane industry. Pellion Technologies, a startup in Massachusetts, makes a battery that it says can store double the amount of electricity of a conventional power pack. It started shipping it last quarter to customers and is planning to ramp up production 10-fold next year. Battery makers are trying to boost energy density by making the anode, the part of the battery that has a negative charge, with other materials. It’s currently graphite, the stuff in pencils. Researchers are replacing parts of it with silicon and a type of lithium known as lithium metal. Conventional batteries contain the element in a salt form but there is also a version that’s a metal, which is typically less stable. Pellion Technologies Inc.’s battery uses lithium metal only when it’s charging, which makes it safe to manufacture, according to CEO David Eaglesham. It started selling it earlier this year with its first order in April. Since then, it’s made about 30,000 cells and expects to raise this to hundreds of thousands next year.